Speed dating tailor made for… “ethnics”! “Neos Kosmos” speaks with the manager of a newly established business that helps members of ethnic communities in Melbourne find an ideal companion. 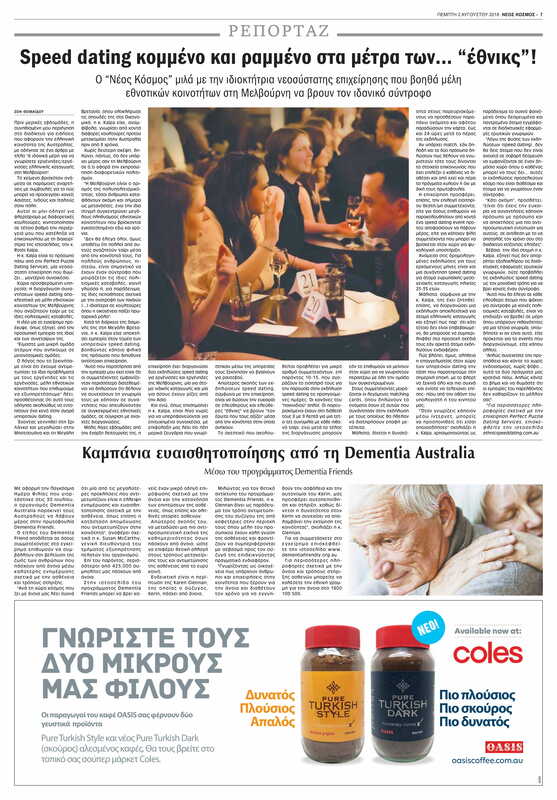 A few weeks ago, my usual browsing of the web for news about the Greek community in Australia led me to an article titled “6 Ideal Places to Meet Greek Singles in Melbourne”. The article was between similar posts with advice on how to approach Asians, Indians and Italians in the city. These mini guides for flirting with different cultures piqued my curiosity to the extent that I ended up communicating with the site’s manager, Ms Roshi Kalpa. Ms Kalpa is the face behind Perfect Puzzle Dating Services, a start-up business that resembles… a modern matchmaking. Main service offered: The organizing of speed dating events exclusively for members of Melbourne’s ethnic communities seeking a match with the same cultural backgrounds. The idea for the project emerged, she explains, from her own personal experience and her partners’. “We are a small group of people belonging to minority groups. The reason we started this business is that we have faced the same problems as singles of ethnic communities that we want to help,” she says, adding that this has led them to identify a gap in the dating services market. Having been born in Asia and raised in Africa and Great Britain, where she completed her studies in Economics, Ms Kalpa undoubtedly had a close encounter with several cultures before moving to Australia eight years ago. Without a second thought, she states, however, there is no place like Melbourne in terms of representing different cultures. “Melbourne is the definition of multiculturalism, so many people arrive even today as immigrants, while at the same time it has a large populations of ethnic communities that have been living here for years. During her stay in Great Britain, Mrs. Kalpa had gained experience in speed dating services by helping a friend of hers to run a business. “What I noticed from my experience there is that participants are more inclined to say they want to keep dating someone at meetings that target specific ethnic groups, compared to open events. Just a few weeks after its opening, the company has organized two speed dating events for the singles of Melbourne, one for people of Indian descent and one for those who have Asian roots. And while, as Ms. Kalpa points out, it is a bit early to take pride in successful matchmakings, she is cautiously telling us that already a few couples who met through their service have started dating. The ultimate goal of speed dating events, according to the company, is to give single “ethnics” the “love they deserve” through the community they belong to. These are speed dating events are boutique events for a small number of participants, currently 10-15. The rules of the “game” are simple. Attendees have at their disposal 8 to 9 minutes for a face to face conversation with each possible match, and after the end of the event they can, if they wish, stay and socialize with the group. Participants get the “matching cards”, where they write the names of those who met at the event with whom they would like to keep in touch later on. In fact, it is possible for the attendees to write more names even after handing the card, up to 24 hours after the end of the event. If there is a match, if both people say they want to get acquainted then they are given the contact information they have chosen to make available. The company also offers a viewer/non-attendee ticket option, for those who either want to attend a speed dating event before deciding to take part, or for the psychological support of a friend who may be attending the event. Amongst the listed events for the coming months is a speed dating meeting for people of European-Mediterranean descent aged 25-35. According to Ms. Kalpa, she has also been asked to organize an event exclusively for people of Greek descent and explains that although this is not confirmed, it could be included in their next events if enough people are interested. But how does a professional in the field of dating services see the trend we see in today’s era, with flirting starting more and more often – and sometimes ending as well – behind our computer or mobile screen? “When you meet someone through the internet, you can pretend to be anyone,” says Ms. Kalpa, using as an example the frequent phenomenon that committed and married people sign up on online dating apps. “Due to the nature of the events (speed dating), you will not see people who are not open to a serious commitment to appear in a public place where anyone can see them… these events attract people who are available and ready to meet a partner. Of course, at the same time Ms. Kalpa explains that she does not entirely reject online dating apps, nor does she see the speed dating events as the only way to meet a mate. “What I would say to every single person who is looking for a companion with shared cultural backgrounds is to seek to find places where there is a chance for such an acquaintance, wherever it may be, whether it’s events we organize or elsewhere.